A variety of strategies for survival of UV irradiation are used by cells, ranging from repair of UV-damaged DNA, cell cycle arrest, tolerance of unrepaired UV photoproducts, and shielding from UV light. Some of these responses involve UV-inducible genes, including the SOS response in bacteria and an array of genes in eukaryotes. To address the mechanisms used in the third branch of life, we have studied the model archaeon, Halobacterium sp. strain NRC-1, which tolerates high levels of solar radiation in its natural hypersaline environment. Cells were irradiated with 30–70 J/m2 UV-C and an immunoassay showed that the resulting DNA damage was largely repaired within 3 hours in the dark. Under such conditions, transcriptional profiling showed the most strongly up-regulated gene was radA1, the archaeal homolog of rad51/recA, which was induced 7-fold. Additional genes involved in homologous recombination, such as arj1 (recJ-like exonuclease), dbp (eukaryote-like DNA binding protein of the superfamily I DNA and RNA helicases), and rfa3 (replication protein A complex), as well as nrdJ, encoding for cobalamin-dependent ribonucleotide reductase involved in DNA metabolism, were also significantly induced in one or more of our experimental conditions. Neither prokaryotic nor eukaryotic excision repair gene homologs were induced and there was no evidence of an SOS-like response. These results show that homologous recombination plays an important role in the cellular response of Halobacterium sp. NRC-1 to UV damage. Homologous recombination may permit rescue of stalled replication forks, and/or facilitate recombinational repair. In either case, this provides a mechanism for the observed high-frequency recombination among natural populations of halophilic archaea. In all organisms studied to date, UV irradiation causes inducible responses. In some bacteria the inducible SOS response involves about 40 genes that are up-regulated dependent on the pleiotropic regulator, LexA . In eukaryotes a variety of genes are up- and down-regulated in response to UV-damage including several DNA repair genes, although no eukaryotic equivalent of the bacterial SOS response has been identified . Among archaea, most studies have heretofore been limited to comparative genomic approaches where inducible mechanisms have not been discernable [3, 4]. The hyperthermophilic archaea have been found to carry homologs of several eukaryotic nucleotide excision repair (NER) genes, including rad2 (FEN1/XPG), rad3 (XPD), eif4A (rad1/XPF), and rad25 (XPB) [5, 6]. Remarkably, extremely halophilic archaea, such as the model organism Halobacterium sp. strain NRC-1, and some non-thermophilic methanogenic archaea, were found to harbor homologs of both eukaryotic NER genes and bacterial NER genes, uvrA, uvrB, uvrC and uvrD [6–8]. The classic SOS response system regulated by LexA is lacking in archaea, however, and the relationship between the bacterial and eukaryotic repair systems in archaea is not currently known . Halophilic archaea, such as Halobacterium spp., are excellent experimental systems for studies of DNA repair because they are amongst the few archaeal microorganisms to encounter high levels of sunlight in their natural environment. They occupy an extreme environmental niche, where exposure to intense solar radiation leads to evaporation and concentration of NaCl to near- or even super-saturation. These microorganisms, including the sequenced wild-type model, Halobacterium sp. NRC-1, are highly resistant to the damaging effects of UV radiation in sunlight, principally due to extremely efficient photoreactivation of DNA damage [10, 11]. In the presence of visible light they can survive UV doses many times higher than they would ever be exposed to naturally. Cell survival approaches 100 % after doses up to 100 J/m2 while 1 hour exposure to sunlight inflicts damage equivalent to, at most, only a few J/m2 [; SM, unpublished]. 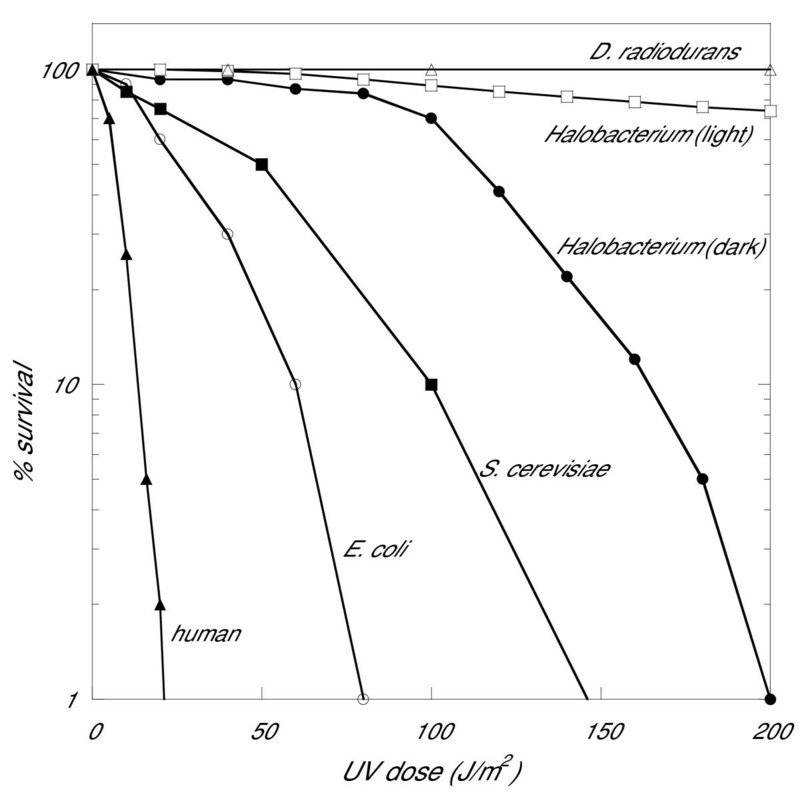 UV tolerance of Halobacterium sp. NRC-1 is compared to other key organisms in Figure 1. Halobacterium is significantly more UV-tolerant, even without photoreactivating light, than Escherichia coli or Saccharomyces cerevisiae, though not as resistant as the extremely radiation-resistant Deinococcus radiodurans. Halophilic archaea also have excision repair mechanisms that can operate in the absence of photoreactivating light [12, 13]. In addition, like bacteria and eukaryotes, they are likely to possess mechanisms that enable them to tolerate the presence of some unrepaired UV lesions, including lesion bypass by DNA polymerases that can circumvent photoproducts ) and recombination to facilitate recovery of stalled replication forks [15, 16]. Survival of model organisms exposed to UV-C radiation. The percent survival (y axis logarithmic scale) is plotted versus dose of UV radiation (x axis linear scale) for human fibroblasts , Escherichia coli , Saccharomyces cerevisiae , Halobacterium sp. NRC-1 (in the dark or in presence of visible light) , and Deinococcus radiodurans . We have taken a multifaceted approach to the study of UV responses in Halobacterium sp. NRC-1. Previously, the critical role for phr2 in light repair was demonstrated through a combination of genetics and biochemistry . Here, we use DNA microarrays to show the importance of homologous recombination genes in the response of cells to UV damage. Interestingly, our results are distinct from those obtained in a previous study on Halobacterium sp. NRC-1 using significantly higher doses of UV irradiation . In order to understand gene expression responses to UV at the whole genome level, we studied the model archaeon, Halobacterium sp. strain NRC-1, employing DNA microarrays. We used three different doses of UV-C, 30 J/m2, 50 J/m2, and 70 J/m2, with post-irradiation incubation times in the dark of 1 hour and 3 hours (Materials and Methods). At these UV doses, survival of cells is close to 100 % following DNA damage either in the light or in the dark (Figure 1) [11, 18]. Cells were irradiated in growth medium with post-irradiation incubation in the same medium so as to introduce minimal additional stresses. To give an indication of repair rates at the doses used, we determined the relative occurrences of cyclobutane pyrimidine dimers (CPDs) and 6-4 photoproducts over time after irradiation with an intermediate dose of 50 J/m2 (Figure 2). The majority of photoproducts were repaired during the 3-hour period, though some cyclobutane dimers still remained at 3 hours. 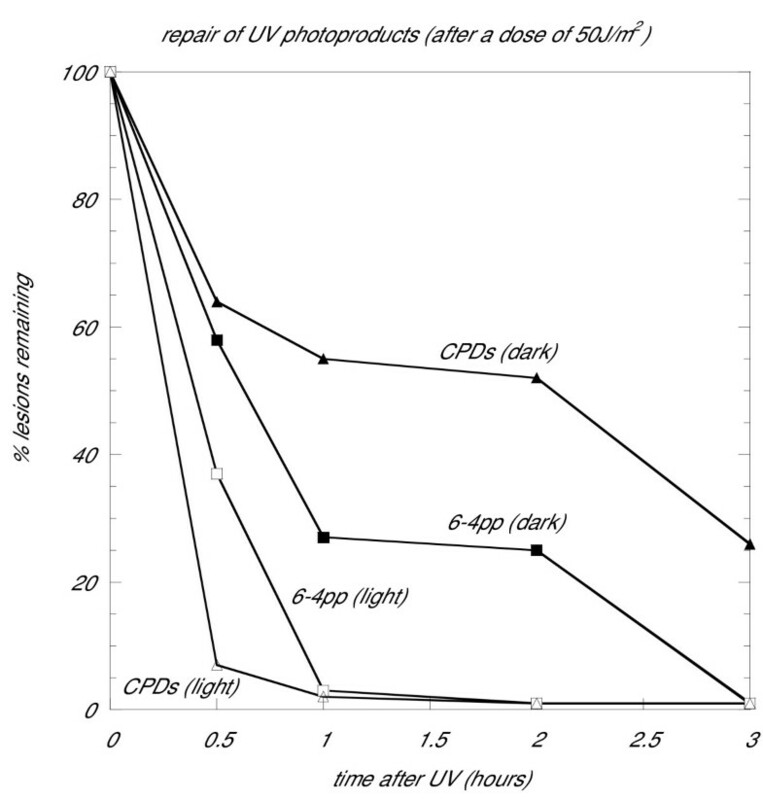 Repair of the two principle UV-induced photoproducts in Halobacterium sp. Repair of cyclobutane pyrimidine dimers (CPDs) and 6-4 photoproducts (6-4 pp) was measured after a UV-C dose of 50 J/m2. About 55 % of CPDs and 25 % of 6-4 pp remain unrepaired after 1 hour; after 3 hours, the percentages are 28% and 2% respectively. Custom DNA microarrays were fabricated using inkjet technology (Agilent Technologies, Palo Alto, CA) with in-house oligonucleotide design performed with the program OligoPicker . The arrays contained 8,455 60-mer nucleotide features representing 2474 open reading frames (ORFs). The high specificity of 60-mer oligonucoletide arrays have been demonstrated previously . Up to three probes were designed per ORF with a mean T m of 81°C and a T m range of 3°C. The microarray slides harbor both gene-probes (~8,000 features per array) as well as ~400 negative and positive control spots to test hybridization conditions and allow for error modeling. These microarrays were thoroughly tested for linearity of response and statistical significance in a related study of anaerobic respiration in Halobacterium sp. NRC-1 . Signal intensities with a dynamic range in excess of three orders of magnitude were found allowing simultaneous analysis of low- and high intensity features. For microarray analysis, two doses of UV-C, 30 J/m2 and 70 J/m2 were used. Microarray data quality was considered high. After removal of outliers, features replicated within a single array showed low differences in absolute processed signal intensities (7 % on average); and spot-to-spot variation for replicate experiments was 9 %. Of the 2474 open reading frames (ORFs) of Halobacterium sp. NRC-1 represented, 100 were significantly up-regulated and 150 were significantly down-regulated (1.5-fold above or below, respectively, p-value < 0.05) in at least one experimental setting. In the current study, we focused on genes involved in homologous recombination and DNA metabolism, which are the most significantly induced (Table 1). Expression levels for all genes represented on the array for the 30 J/m2 dose are also provided (see Additional file 1). Data obtained from UV irradiation with 70 J/m2 were essentially the same (not shown). At either dose, the pattern of inducible transcripts was very different from what would be seen in E. coli, not surprisingly, since there is no LexA homolog in Halobacterium sp. NRC-1. Moreover, there was no evidence of a classic coordinated SOS response and neither the prokaryotic DNA repair genes, including uvrA, uvrB, uvrC and uvrD nor any of the eukaryotic repair gene homologs were up-regulated. UV irradiation (30 J/m2)-inducible recombination- and DNA metabolism genes in Halobacterium sp. NRC-1. a Fold induction after irradiation with 70 J/m2. 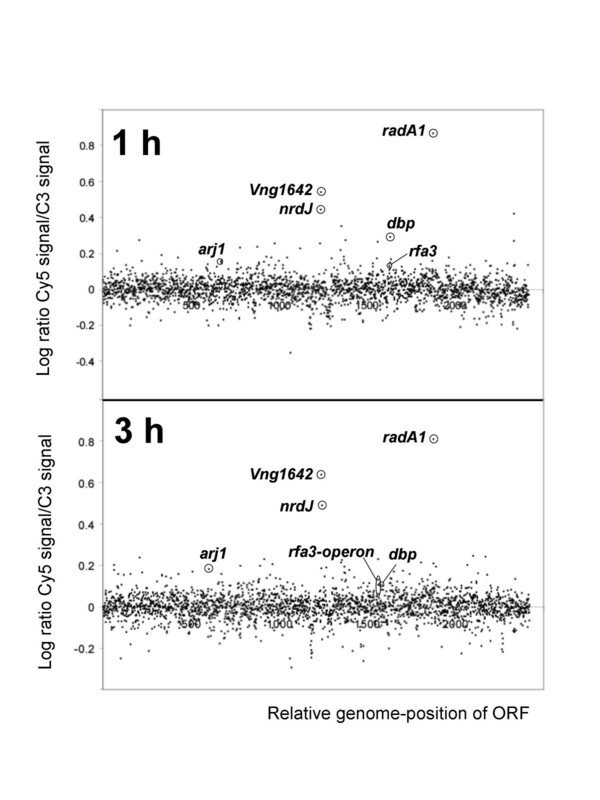 Strikingly, however, the radA1 gene showed the most inducible transcript (~7 fold) at 1 hr and 3 hrs after both UV doses (Table 1; Figure 3). RadA1 is the Halobacterium sp. NRC-1 homolog of RecA/Rad51, which catalyses strand invasion and exchange during homologous recombination. RadA1 is more similar to Rad51 in eukaryotes than to bacterial RecA. Deletion of radA has been shown to cause severe UV sensitivity in the related halophililc archaeon, Haloferax volcanii . The expression change of radA1 was considered statistically highly significant based on the following: The radA1 gene is represented by 3 different probes per array with one of those probes being duplicated, combining to a total of 24 data points for that gene in the present report. In addition, cDNA was prepared from three independently treated cultures per condition and array. The average standard deviation of the fold changes for all radA1-probes within an array was 0.85, while the array-to-array difference for identical probes in replicated experiments was 18 %. The average p-value of log ratios was < 10-22. Results from previous transcriptome profiling after environmental perturbations indicate that a 7-fold expression change is high in comparison to any gene in Halobacterium sp. NRC-1 [; JM and SD, unpublished data]. In those experiments (5 different conditions not involving UV irradiation) the radA1 gene was not differentially expressed demonstrating that the induction presented here was caused by UV irradiation. Whole genome microarray hybridization results comparing UV-irradiated cells to control cells. Irradiated cells received a UV-C dose of 30 J/m2 and incubated in the dark for 1 h (upper panel) and 3 h (lower panel). Control cells were treated exactly the same except for UV-irradiation. For each ORF represented on the array, the logarithm of the hybridization ratio of UV-irradiated cells (Cy5-labeled cDNA) to control cells (Cy3-labeled cDNA) is displayed in black marks on the y axis. The location of ORFs within the entire 2.6-megabase genome maps on the x axis. Expression ratios of selected genes are indicated. The radA2 (radB) gene, a second homolog of recA in archaea, encoding a protein with unknown role in homologous recombination, was not up-regulated, in agreement with observations in other archaea . Accompanying radA1 induction, several other genes involved in homologous recombination were significantly induced after UV irradiation. The dbp gene, encoding a eukaryote-like DNA binding protein of the superfamily I DNA and RNA helicases, was upregulated 1.95 (p-value 0.04) at 1 hr post UV-irradiation with 30 J/m2. The arj1 gene, encoding a recJ-like exonuclease was up-regulated 1.5 fold (p-value 0.008) at 3 hrs (30 J/m2). Additionally, an apparent operon encoding RPA ssDNA binding protein complex, rfa3, (VNG2160, RPA41 homolog, Zn-finger containing), rfa8 (VNG2162, RPA32 homolog), and an uncharacterized linked ORF (VNG2163) was induced 1.53 ± 0.02 fold (p-values < 0.001) at both time points after irradiation with 70 J/m2. Similar fold changes were measured after irradiation with 30 J/m2, however, p-values were around 0.1. In eukaryotes, RPA-ssDNA complexes are formed during almost all DNA-damage repair pathways. For example, RPA-proteins are recruited to Rad51 foci, protein complexes that accumulate at sites of DNA damage and stalled replication forks [24, 25]. None of the other four RPA homologs of Halobacterium sp. NRC-1 (VNG0133, 1253, 1255, 6403) was significantly differentially expressed. As for radA1, neither of the above genes were found to be differentially expressed in other environmental perturbation experiments [; JM and SD, unpublished data]. Our microarray data, together with these findings, strongly suggest a key role for homologous recombination in survival of UV damage in this class of archaea. By analogy with other organisms, there are at least two ways that recombination might contribute to survival of UV damage in Halobacterium sp. NRC-1. (i) Recombinational rescue of stalled replication forks may take place [15, 26]. Rescue of stalled forks is likely to be error-free and this would fit with the low mutation rate in Halobacterium spp. [27; SM, unpublished data]. (ii) Recombinational repair may occur by using duplicate copies of the genome, a mechanism that has been suggested to facilitate post-irradiation survival of D. radiodurans . Halobacterium sp. NRC-1 is thought to contain multiple copies of its genome (J. Soppa pers. com. ), which may greatly enhance recombinational repair. In addition to genes involved in homologous recombination, several other genes were also highly induced. Most interestingly, the gene encoding a cobalamin-dependent class II RNR (nrdJ, formerly nrdB2) was strongly up-regulated (Figure 3, Table 1). A small open reading frame (VNG1642) located immediately downstream to nrdJ encoding a small uncharacterized zinc-finger containing protein (COG1645) was also strongly induced. RNR is the rate-limiting enzyme in the de novo synthesis of deoxyribonucleotide triphosphates which are utilized in both DNA synthesis and DNA repair; the up-regulation of the nrd genes may reflect the need for increased deoxynucleotide concentrations to allow rapid and accurate excision repair. In yeast, DNA damage elicits an increase in dNTP levels; and increased dNTP pools improve cell survival post DNA damage . In many other organisms, RNR genes are up-regulated by UV and were among the very first UV-inducible genes identified in an early study of UV-inducible promoters in budding yeast . RNR is regulated during the cell cycle in eukaryotes and the UV response depends on binding of transcription factor E2F to sites in the promoter . It is noteworthy that, in E. coli, nrd genes are UV-inducible even in the absence of lexA . In addition to nrdJ, arcBCA, required for fermentation of arginine  were also particularly strongly induced, though only at the early time, and with some variation in magnitude of induction between repeat experiments. Whether this induction reflects a demand for rapid supply of ATP during periods of DNA-damage repair is not known. Another possibility is that the expression of these genes is exquisitely responsive to small stresses and we view these results with some caution at this stage. A previous transcriptome analysis of UV-irradiated Halobacterium sp. strain NRC-1 cultures  showed, as we do, the lack of an SOS-like response and the lack of up-regulation of any of the NER genes by UV. However, these authors did not report strong induction of recombination genes or of RNR genes. The UV dose used in the latter study was substantially higher (200 J/m2). This dose, which induces, approximately one photoproduct per 600 bp of DNA, causes about one hundred times as much DNA damage as induced by natural sunlight and resulted in compromised cell survival. It may be that the high UV dose caused interference with gene expression. This is in contrast to approximately one photoproduct per 4 kb at 30 J/m2 and one per 1.7 kb at 70 J/m2 [33–35], doses tolerated by Halobacterium sp. NRC-1 and used in the current study. There have been questions raised as to the significance of gene expression responses to UV and other DNA damaging agents. In the yeast, S. cerevisiae, an analysis of deletion mutants lacking UV-inducible genes suggested that most do not contribute to survival of UV irradiation . In addition, most yeast genes identified as having a role in surviving UV damage, by isolation of UV-sensitive mutants, including most NER genes, are not UV-inducible. In human cells too, most repair genes are not UV-inducible . Thus, transcriptome analysis must be interpreted with caution and inferences about the extent of gene involvement should be supported by physiological and functional studies. In the present report, the absolute contribution of the different DNA-damage repair systems has not been investigated. However, the high level of up-regulation of radA1 and induction of other recombination genes while comparable few other gene expression changes occur, clearly suggests a significant role of homologous recombination in DNA-damage repair in Halobacterium sp. NRC-1. Our transcriptome profiling work, together with our studies of the physiological response of a model archaeon, has shown that genes involved in homologous recombination are induced by UV irradiation in relatively low doses. Our results are consistent with homologous recombination playing an important role in the cellular response to UV damage in Halobacterium sp. NRC-1, either to permit rescue of stalled replication forks or to facilitate recombinational repair. In either case, we find that induction of recombination genes is prominent in the response of Halobacterium sp. NRC-1 to UV irradiation, which is particularly significant as it has been shown recently that recombination is important in facilitating genetic exchange in wild populations of halophilic archaea . Our results suggest that homologous recombination is stimulated by sunlight in this model archaeon. Halobacterium sp. strain NRC- 1 was grown at 37°C under aerobic conditions to early exponential growth phase (OD600 0.19 – 0.23) in complete medium  and irradiated in the dark, in medium, using a UV-C source with dose rate of 1 J/sec/m2. Post-UV incubation was continued at the same temperature, without changing the medium. Typically, UV-irradiation is not carried out in growth media because of possible absorption of UV wavelengths. For the present microarray experiments, irradiation in growth medium was of particular importance to avoid additional stress caused to the cells by harvesting and changing media. Moreover, we ascertained that the absorption of UV-C by the growth medium used was minimal by measuring transmission of 260 nm light in a spectrophotometer. The effective UV dose was not significantly affected by irradiating in medium. A dot-blot immunoassay for differential quantitation of CPDs and 6-4 photoproducts was carried out as described in detail previously . Briefly, exponential phase cells were harvested and irradiated in sterile salts solution with UV-C at a dose rate of 1 J/sec m2. Aliquots of yeast extract and casein hydrolysate solutions were added to restore nutrients and the irradiated cells were incubated aerobically at 37°C to allow repair to proceed. All irradiation and post-UV incubation was carried out either under yellow light illumination or in the dark. Samples were taken at timed intervals and DNA extracted for measurement of photoproducts. DNA concentrations in different samples were carefully equalised. Subsequently, each DNA sample was divided into two and one half was treated with hot NaOH to destroy 6-4 photoproducts. Two identical dot blots were prepared on nitrocellulose filters, each containing a set of dilutions of each DNA sample. One filter was exposed to a CPD photolyase to destroy cyclobutane dimers in all the DNA samples on that blot to allow measurement of 6-4 photoproducts alone. The dot blots were then exposed to rabbit polyclonal antiserum containing antibodies to 6-4 photoproducts and CPDs, then to biotinylated anti-rabbit antibody followed colorimetric quantitation using alkaline photsphatase-conjugated Extravidin (Sigma), Nitro Blue tetrazolium (NBT) and 5-bromo-4-chloro-indolyl phosphate (BCIP) substrate. The amount of color was measured using a scanning densitometer (BioRad GS-670) and compared to a set of standards included on each blot. Relative mRNA levels were determined by parallel two-color hybridization to oligonucleotide (60-mer) microarrays representing 2474 ORFs representing 92 % of Halobacterium sp. NRC-1 ORFs according to Müller and DasSarma . Transcriptome profiling of cells irradiated with 30 J/m2 was carried out in duplicate. Transcriptome analysis of cells irradiated with 70 J/m2 was carried out only once since results were essentially the same as for 30 J/m2. Total RNA was isolated from 50 ml cultures immediately after harvesting at 2°C using Agilent Total RNA isolation kit (Agilent) and DNA was hydrolysed using amplification grade DNase (Sigma, UK). In order to minimize biological noise, RNA preparations from three cultures grown under identical conditions were pooled to equal parts for cDNA synthesis. cDNA was prepared from 7 μg total RNA with Super Script III reverse transcriptase (Invitrogen, UK) and Cy3- or Cy5-dCTP (Amersham Biosciences, UK). Performance of duplicate experiments in which dyes were swapped during synthesis to account for labelling differences was not required. Previous results showed that differences in the relative intensity of the channels could be adjusted for by intensity-dependent LOWESS normalization [; JM and SD, unpublished data]. cDNA preparations were purified after alkaline hydrolysis of RNA on Qiagen mini-elute columns (Qiagen, UK). The labeled cDNA targets were mixed with hybridization buffer (Agilent) and control targets (Agilent), and hybridized to microarray slides, assembled into a hybridization chamber (Agilent), for 17 h at 60°C in the dark. Post hybridization, the slides were washed as described  and scanned for the Cy3 and Cy5 fluorescent signals with an Agilent DNA-microarray scanner (Model no. G2565BA). Image processing and statistical analysis were carried out using Agilent Feature Extraction Software Version 7.1 as described previously . Log ratios for each feature were calculated and the significance of the log ratio was assessed by calculating the most conservative log ratio error and significance value (p-value) using a standard error propagation algorithm (Agilent) and a universal error model (Rosetta Biosoftware). We thank James P. Carney for critical reading of the manuscript. This work was supported by NSF grants MCB-0450695 and MCB-0296017 to SD and by BBSRC project grant P18099 to SM. SM designed the experiments, analyzed the data, and drafted the manuscript. JM assisted with experimental design, conducted the DNA microarray hybridization, and carried out bioinformatics and data analysis. IB assisted with experimental design and conducted the UV irradiation, RNA preparation, and cDNA labelling. BB assisted with bioinformatics analysis. WN assisted with UV irradiation, RNA preparation, and cDNA labelling. SD designed the experiments, assisted with data interpretation, and prepared the manuscript.